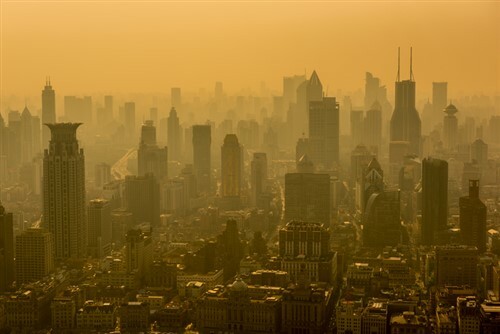 Rising global temperatures are forecast to hit a number of emerging markets the hardest – and companies operating in or sourcing from the regions face escalating risks, new research has revealed. Africa and South East Asia are expected to bear the economic brunt of rising temperatures over the next 30 years, as intensifying levels of heat stress are projected to cut worker productivity and hit export revenues, risk analytics firm Verisk Maplecroft has found. Not only will workers in the highest risk regions struggle to cope with mounting heat stress, but burgeoning urbanisation and booming demand for air conditioning will also pose a major threat to reliable electricity supplies. For companies doing business in the regions, the risk of disruption will “substantially increase” unless climate adaptation measures are implemented, the study warns. In all, 48 countries are rated ‘extreme risk’ in the Heat Stress (Future Climate) Index, with African countries accounting for nearly half that number. While Europe is gripped by a heatwave, it remains the region most insulated from the economic impacts of rising heat stress. The 10 lowest risk countries include the UK, Ireland, Finland, Norway, Sweden, and Denmark. However, following July warnings from academics that similar heatwaves will become far more common in Europe without actions to curb emissions, regional risks from heat stress are likely to increase. Agriculture, oil and gas, and mining are sectors in which rising heat stress will impact labor capacity the most, as work is highly intense and often outdoors. Heat stress can reduce worker productivity by causing dehydration and fatigue, leading to slower work and even death in extreme instances, according to Verisk. Given the importance of the extractives and agricultural sectors to export economies in West Africa, the impacts of rising heat stress on labor capacity are projected to have particularly severe consequences. Oil outputs from Nigeria, West Africa’s largest economy, are likely to suffer, while cocoa exports from Cote d’Ivoire and Ghana are particularly vulnerable. The manufacturing sector in South East Asia is also under threat. 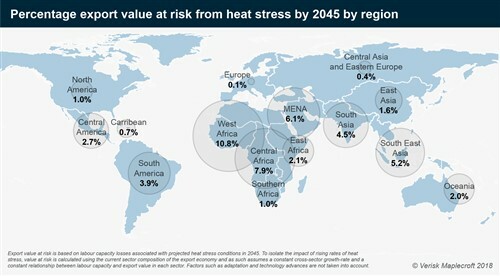 As a result of heat stress-related losses, the export value at risk stands at 5.2% by 2045, according to the data. Vietnam and Thailand – key exporters of machinery and electrical components – account for almost two thirds of the region’s total manufacturing export value projected to be at risk.